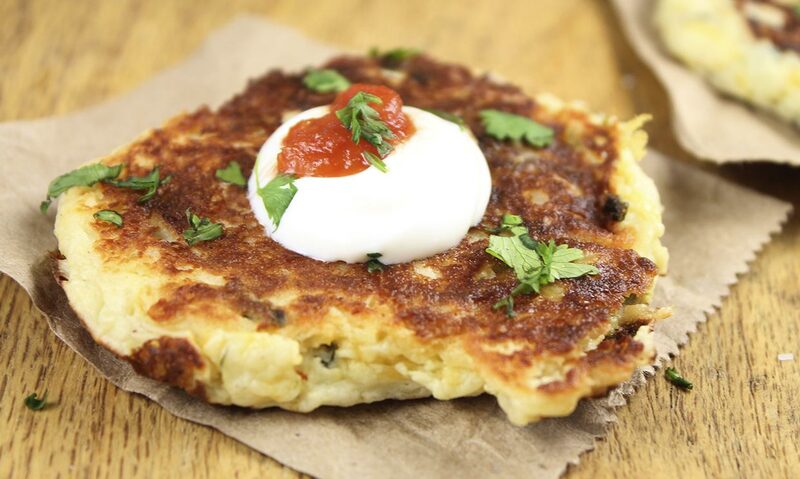 Use our Garlic Mashed Potatoes, onions and poblano peppers to put a bold twist on the traditional potato pancake. Place onion and poblano pepper onto a small baking sheet and brush with 1 tsp. olive oil and sprinkle with salt and pepper. Broil for 10-12 minutes or until onions just start to brown. Remove and set aside to cool slightly. Dice onions and peppers and set aside. Place a nonstick skillet over medium- high heat and add about 1 tbsp. olive oil per batch. Spoon potato mixture into pan in about ¼ cup dollops, cooking 3-4 at a time. Turn to brown on both sides, about 5-7 minutes per side. Carefully remove to a wire rack to cool slightly. Garnish with sour cream, salsa and cilantro. 1 Preheat oven to broil. 2 Place onion and poblano pepper onto a small baking sheet and brush with 1 tsp. olive oil and sprinkle with salt and pepper. 3 Broil for 10-12 minutes or until onions just start to brown. Remove and set aside to cool slightly. 4 Dice onions and peppers and set aside. 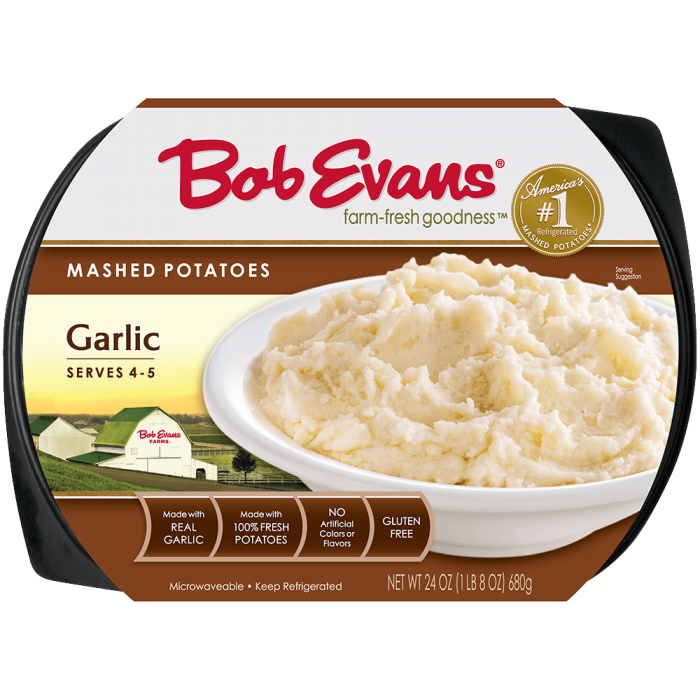 5 Add Garlic Mashed Potatoes, egg, diced onions and peppers, cheese, flour and baking powder into a large mixing bowl. Stir to combine. 6 Place a nonstick skillet over medium- high heat and add about 1 tbsp. olive oil per batch. 7 Spoon potato mixture into pan in about ¼ cup dollops, cooking 3-4 at a time. Turn to brown on both sides, about 5-7 minutes per side. 8 Carefully remove to a wire rack to cool slightly. Garnish with sour cream, salsa and cilantro.